Electromagnetic metamaterials boast special properties not found in nature and are rapidly emerging as a hot research topic for reasons extending far beyond “invisibility cloaks.” Beyond invisibility cloaks? 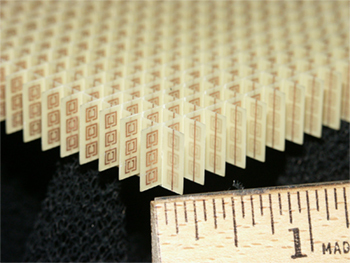 Flexible metamaterial absorbers developed. One other use for metamaterials is as “absorbers” of electromagnetic radiation. In the journal Applied Physics Letters, from AIP Publishing, a research team in Korea reports creating a flexible metamaterial absorber, based on tiny “snake-shaped” unit cells, with the ability to suppress electromagnetic radiation from mobile electronics and other electronic devices. A negative index of refraction is one metamaterial “superpower” that enables applications such as a super lenses, cloaks, absorbers, and countless others, to operate at frequencies ranging from radio to visible. By tapping into a negative index of refraction, metamaterial absorbers can be created that are both smaller in size and thickness than conventional absorbers. “The unit size of typical metamaterial absorbers, however, is still only 1/3 to 1/5 of the wavelength of the incident electromagnetic wave,” explained YoungPak Lee, a physics professor at Hanyang University in Seoul, Korea. The team’s first attempt at designing a metamaterial absorber for long-wavelength MHz electromagnetic waves didn’t turn out as planned– the unit size actually increased, which limited its applications in suppressing the radiation from mobile devices and other electric equipment. This turned out to be a good thing because as they addressed this problem, Lee and colleagues ended up discovering a way to create a flexible metamaterial absorber. Metamaterials are a type of resonator, with a resonance frequency that can be explained by its inductance and capacitance. So the team chose “snake-shaped” structures to enhance its inductance and shrink the unit size. “In this case, think of the length of the ‘snake bar’ as the inductance. When we increase the length of the snake bar, the frequency of the resonance peak shifts to a lower frequency (longer wavelength) — keeping the unit size small,” Lee said. “By using a Teflon substrate as the dielectric layer, we can make it thin and elastic enough to be suitable as a flexible metamaterial.” Flexible metamaterial absorbers developed. As part of their research, the team specially designed two types of absorbers at 2 GHz and 400 MHz, focusing on keeping the unit size small and flexible, because most telecommunication devices — including mobile phones — operate within the 400 MHz to 2 GHz range. “Absorbers for GHz and MHz ranges can be used to suppress electromagnetic noise from everyday electronics,” Lee noted. The next step for the researchers will be to try to create an even lower-frequency metamaterial absorber, with a range below 400 MHz, while also maintaining a small size and flexibility. “We’re also exploring wideband and thinner metamaterial absorbers within the MHz range,” Lee said. Flexible meta-material absorbers developed.